UBS has appointed former U.S. Congressman Jeb Hensarling, R-Texas, as its executive vice chairman of the Americas region, the company says. The lawmaker-turned-bank director was known for trying to weaken financial regulators. The former congressman, who represented Texas’s Fifth Congressional District in the House of Representatives from 2002 to 2019, will be based in Dallas and handle regional duties across all UBS Americas operations, according to a press release from the company. He will work with the firm’s executives, financial advisors and bankers, UBS says. Hensarling was chair of the House Financial Services Committee before the recent midterm elections, when Rep. Maxine Waters, D-Calif. took over the role. In 2016, the former congressman introduced the Financial CHOICE (Creating Hope and Opportunity for Investors, Consumers and Entrepreneurs) Act, aimed at drastically overhauling the Dodd-Frank Act by weakening the power of the SEC, the Consumer Financial Protection Bureau and the Financial Stability Oversight Council to police the financial services industry, but also raising maximum fines on advisors and firms found guilty of fraud and increasing the amount of money that could be returned to harmed investors. 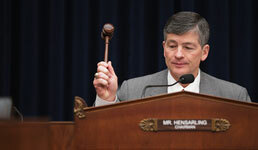 Prior to serving in Congress, Hensarling had worked in financial services, the energy sector and corporate and real estate law, according to UBS.